In our legislative texts (the Rules of 1749, the Constitutions of 1764 and the Constitutions and Statutes of 1982) there is nothing about the Coat of Arms of the Congregation. They speak only of the seal. However this seal has always been used as the Coat of Arms of the Congregation. 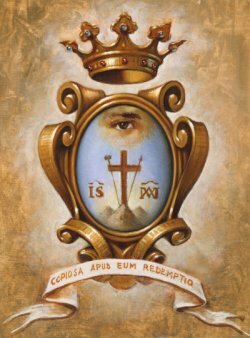 “The seal of the Congregation consists of a cross with a lance and sponge mounted on three hills; on either side of the cross are the abbreviated names of Jesus and Mary; above the cross is an eye sending forth rays; over all a crown. Around the seal is the motto: “With him is Plentiful Redemption” (cf. Ps. 129,7)”. From the beginning of the foundation the necessity of having a seal was recognized. It was required to guarantee the legality of documents presented to religious or civil authorities for the approbation of the Institute and its Rules and for new foundations. 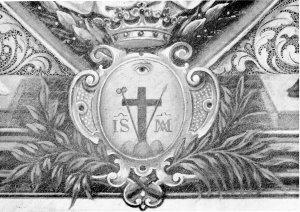 For this purpose St. Alphonsus and his first companions chose some religious symbols that in some way indicated the idea or purpose of the new Institute, adding some decorative elements that more or less followed the rules of heraldry. The elaboration of the seal took some years, though we do not know precisely the different steps taken before arriving at the final version. In the Casa Anastasio, Scala,there is a drawing sketched on a wall attributed to Brother Vitus Curzio, that is considered the first seal of the Institute. 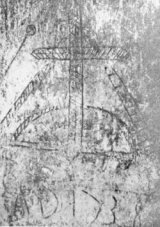 On this wall, over the cooking stove, the cross can be seen above a hill, also the lance, the sponge and a ladder with the date 1738. The seal of the Congregation had to be defined before the pontifical approbation of the Rules (1749), as we see in the Acts of the chapter of 1747. The Secretary had written: “the seal: the cross over three hills, and above the cross a radiant eye. St. Alphonsus erased the words “and above the cross a radiant eye and added: “the cross with the lance and the sponge, and at the side the names of Jesus and Mary. Above the cross a radiant eye and over all, the crown”. Then immediately follows the design of the seal. In this seal, however, which seems to have been designed by St. Alphonsus we have the motto Copiosa apud eum redemptio and the coat of arms is supported by two small branches (of palm?) This last detail does not appear in any seal or coat of arms and finds no place in the legislation of the Congregation. From the second half of the nineteenth century the branch of laurel or olive and sometimes of palm appears frequently in the coat of arms of the Congregation, though on this matter the Constitutions are silent. Two years after the Assembly of 1747 the seal of the Congregation appears on the cover of the second edition of the Visits to the Most Blessed Sacrament, published in Naples in 1749 and from then on was considered the seal of the Congregation. There has never been an official explanation of the elements that constitute the seal or coat of arms of the Institute. The symbolic elements of which it is composed represent the work of Redemption carried out by Jesus Christ and which the Institute was to proclaim under the protection of Mary. This explains the cross on the hill with the lance and sponge, the names of Jesus and Mary and the motto Copiosa apud eum redemptio. In heraldry an eye within an equilateral triangle is the symbol of the Trinity. Since the triangle is missing here, the eye can be interpreted as the gracious mercy of God to humanity, divine providence. The crown, or the branches of palm, olive or laurel can be considered as complimentary heraldic elements or adornment. The crown over the coat of arms can be interpreted as the crown of glory that is the reward for persevering in one’s vocation. The same interpretation of triumph and reward can be given to the palm, olive and laurel. The three summits of the mountain have no special symbolical value. It is the usual way to represent a mountain according to the norms of heraldry. and spirituality of a missionary Institute with the name of the Holy Savior. Some biographers, however, consider that in some way the elaboration of the seal was influenced by extraordinary events that took place in Scala during the exposition of the Most Blessed Sacrament on the occasion of a triduum preceding the foundation of the Institute, November 9, 1732. Witnesses testify to have seen in the Host a cross in black or dark color above a mountain together with the instruments of the Passion. Others speak of a star or stars and of something white like a cloud. St. Alphonsus says that he saw “a dark colored cross and what seemed a small cloud like a star that was whiter than the sacramental species at the side of the dark colored cross”. Mgr. Falcoia informed St. Alphonsus the day following the first apparition on September 11, 1732, that having overcome their initial shock, the Sisters felt that “by this His Divine Majesty wished to authorize and confirm the Institute”. Taking all this into consideration there is nothing strange about the coincidence of the principal elements of the seal or coat of arms and the basic contents of the Eucharistic apparitions – the mountain, the cross and the instruments of the Passion. Mgr. Falcoia had proposed as a motto for the seal in 1736 Jer. 1,11: Virgam vigilantem ego video, but St. Alphonsus preferred Ps.129,7: Copiosa apud eum redemptio. He used these words of the psalm repeatedly in his writings, always with the declared intention of encouraging the confidence of the sinner in the infinite mercy of God. Through Jesus Christ in the work of redemption He had shown his immense love for all mankind in pardoning our sins and making us his children. Redemption is the proof that God loves us and has mercy on us because he has pardoned us and filled us with good things. In his book, Translation of the psalms and canticles of the Divine Office, St. Alphonsus indicates in the introduction that the fundamental theme of this psalm is an expression of the confidence of the sinner in the divine mercy through Jesus Christ. “In this psalm we consider the Jews before their liberation from Babylon. It serves, however, for every sinner who, oppressed by the weight of his sins, implores the help of God”. And on verse 7 St. Alphonsus comments thus: “Here the prophet indicates the basis of all our hopes, which is the blood of Christ with which he redeemed the human race. He says this, because the mercy of God is infinite and able to redeem us from all our evil deeds with abundant helps”. Redemption is plentiful not only because it frees us from sin and all its effects, but also because it gives us a new life in Christ. St. Alphonsus expresses this when he compares verse 7 of psalm 129 with other texts that speak of the “abundance” of grace and the new life especially in John. 10,10: I have come that they may have life and have it in abundance”, and in Romans 5,15: for God’s act of grace is out of all proportion to the wrongdoing and again in Romans 5,20: Where sin increased, God’s grace increased much more. In harmony with St. Alphonsus, the Constitutions understand redemption in its widest sense, since Constitution 6 describes the Redemptorists as “humble and courageous servants of the Gospel”. “This message has for its special object plentiful redemption; it proclaims the love of God the Father ‘who first loved us and sent his Son to be the expiation for our sins’ (1 John. 4.10) and through the Spirit gives life to all who believe in Him. This redemption affects the entire person. It brings to perfection and transforms all human values, so as to unite all things in Christ (cf. Eph. 1,10; 1 Cor. 3,23) and thus leads them to their completion in a new earth and a new heaven (cf. Rev. 21.1)”. On the occasion of the third centenary of the birth of St. Alphonsus (1996) the Pope defined in a more explicit manner the fundamental significance of copiosa redemptio as the mercy and love of God for humanity. As we can see the Coat of Arms of the Congregation and especially the motto Copiosa apud eum redemptio has acquired greater importance today than in the past and can be considered as a clearer expression of the identity and mission of the Congregation of the Most Holy Redeemer.